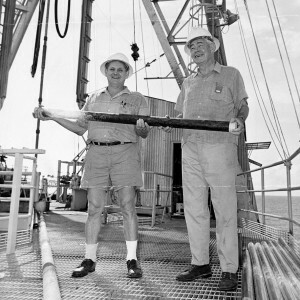 Climates of the distant past are often studied using cores taken from ocean bottoms; Lamont scientists have been the leaders in collecting and studying these, and the institution holds the world’s largest repository. Above, deputy director J. Lamar Worzel and director Maurice Ewing on the research vessel Glomar Challenger, 1968. 1956: A theory of ice ages Maurice Ewing and William Donn, Science Maurice “Doc” Ewing, one of the world’s most influential oceanographers and Lamont’s first director, teamed with geologist Donn to propose that ice ages are driven by self-perpetuating natural cycles of freezing and thawing of the Arctic Ocean. This paper and two followups were seized upon in popular literature of the time to suggest that a new ice age would arrive soon. Although scientists’ views shifted radically as more evidence came in, this initiated Lamont’s tradition of studying large-scale climate swings. 1960: Natural radiocarbon in the Atlantic Ocean Wallace Broecker et al., Journal of Geophysical Research Wallace Broecker, one of the founders of modern climate science, showed how isotopes of carbon produced by natural and human processes could be used to map ocean currents that we now know form a series of global-scale loops. This led to an overarching model of the “Great Ocean Conveyor Belt” and the idea that changes in the conveyor may bring sudden, powerful shifts in the global climate. 1966: Paleomagnetic study of Antarctic deep-sea cores Neil Opdyke et al., Science By systematically examining Antarctic seabed sediments, Opdyke and colleagues showed that periodic shifts in earth’s magnetic polarity could be used to accurately date sediment layers back beyond 2 million years—and thus climate shifts from those ancient times. Previously, the limit was only 25,000 years. This set the stage to test theories of climate change in deep time. 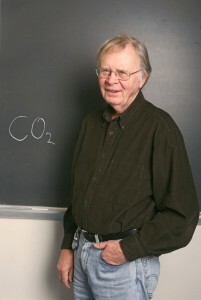 Wallace Broecker, who joined Lamont 60 years ago, is considered one of the founders of modern climate science. He has made some of the most important discoveries about oceanography and climate, and continues his work today. 1973: Are we on the brink of a pronounced global warming? Wallace Broecker, Science This is the paper generally credited with coining the phrase “global warming” in scientific literature. The planet at that time was emerging from a decades-long natural cooling cycle, which Broecker postulated had been masking an ongoing warming effect caused by rising industrial carbon-dioxide emissions. Broecker predicted that as the cooling cycle bottomed out, global temperatures would rise swiftly. He was right. 1976: The surface of the ice-age Earth CLIMAP, Science CLIMAP, an international project in the 1970s-80s, reconstructed the world’s sea-surface temperatures, and thus overall climate, during the last glaciation. The main evidence was deep-sea cores—many taken by Lamont scientists and held in the Lamont Deep-Sea Core Repository, the world’s largest. 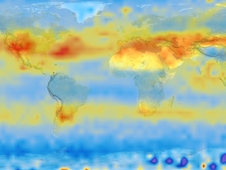 It was the first comprehensive look at earth’s temperature for a time markedly different from our own. 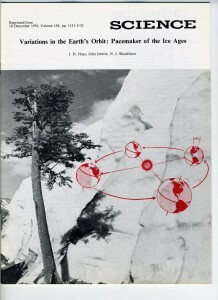 1976: Variations in earth’s orbit—pacemaker of ice ages James Hays, John Imbrie, Nicholas Shackleton, Science In the 1920s, Serb mathematician Milutin Milankovic proposed that earth’s ice ages coincide with cyclic changes in the eccentricity, axis orientation and wobble of the earth as it orbits the sun. The idea was long debated. This paper finally proved to most scientists’ satisfaction that Milankovic cycles are real. Lamont’s James Hays worked with two other giants of modern science: Brown University’s John Imbrie and Cambridge’s Nicholas Shackleton. 1978: The Marine oxygen isotope record in Pleistocene coral, Barbados, West Indies Richard G. Fairbanks et al., Quaternary Research This paper documented the magnitude and rapidity of sea-level rises when ice sheets and glaciers melted at the ends of several previous ice ages. Other Lamont researchers have followed with many more studies to the present quantifying past changes in sea level. These studies are key to understanding how current melting of ice may affect us in the near future. 1986: Experimental Forecasts of El Niño Mark Cane, Stephen Zebiak et al., Nature El Niño is earth’s most powerful natural climate cycle, shifting precipitation and temperature patterns, to affect crops, disease outbreaks and natural hazards globally. Its physics and variable timing were long cloaked in mystery. Cane and Zebiak were the first to construct a model that explained how it worked, and could successfully predict an El Niño. This and related work led to forecasts that are now used worldwide to plan for crop planting, public-health initiatives and emergency relief efforts. 1986: Inter-Ocean Exchange of Thermocline Water Arnold Gordon, Journal of Geophysical Research In conjunction with earlier oceanographic work, laid out how differences in the temperature and salt levels in different layers drive the exchange of water between oceans, and, ultimately, affect climate over vast distances. Gordon and colleagues continue to work on questions of large-scale ocean circulation in Indonesia, the Southern Ocean and elsewhere. 1988: Influence of late Cenozoic mountain building on ocean geochemical cycles Maureen Raymo et al., Geology While still a grad student, Raymo published the first of a series of papers on the Uplift-Weathering Hypothesis. This proposes that earth's climate started cooling when tectonic forces caused the Himalayas and Tibetan Plateau to start rising some 40 million years ago. The elevation increased the weathering of minerals, which drew more carbon dioxide from the air, weakening the greenhouse effect and bringing the glaciation of the poles we see today. This still controversial idea has stimulated a large, continuing body of research. 1989: The role of ocean-atmosphere reorganizations in glacial cycles Wallace Broecker and George Denton, Geochimica Cosmochimica Acta This study explored the role of freshwater inflow into the northern North Atlantic, via melting ice, in governing the oceanic “conveyor belt,” and its possible association with disruptions of currents that could cause sudden, large-scale climate changes. Followed by many other papers including 1992’s Evidence for Massive Discharges of Icebergs into the North Atlantic Ocean During the Last Glacial Period (Gerard Bond et al., Nature). With glaciers now melting worldwide, understanding their dynamics past and present is key to projecting the future. Lamont scientists study ice trends all over the world. 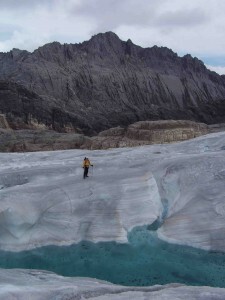 Here, a researcher on an expedition to core the waning glacier atop Indonesia’s Puncak Jaya, earth’s highest peak between the Andes and the Himalayas. 1995: Temperature histories from tree rings and corals Edward Cook, Climate Dynamics Cook, now head of Lamont’s Tree Ring Lab, showed how tree rings dating back as far as 1,000 years correlated with both modern instrumental records and marine corals to show anomalous warming during the 20th century in many parts of the world. Working from places ranging from Tasmania and South America to Mongolia, North America and Scandinavia, lab scientists have since published many more papers on how tree rings illuminate regional and global climate histories. These include a monumental drought atlas of Asia, published in 2010. 1995: Plio-Pleistocene African climate Peter de Menocal, Science This connected the evolution of humans with a shift toward more arid conditions in the east African climate after 2.8 million years ago. The change resulted in the development of open savannahs where newly upright human hunters are thought to have thrived. It was one of the early papers suggesting climate’s basic effects upon humans. Many uncertainties persist about early human evolution, but many scientists continue investigations of the evolution-climate link. 2000: Climate change and the collapse of the Akkadian Empire: evidence from the deep-sea Heidi Cullen, Peter de Menocal et al. Geology The sophisticated Akkadians ruled the Middle East until 4,200 years ago, when their empire suddenly collapsed. Heidi Cullen (who later became a popular TV personality covering climate) linked it with an abrupt 300-year drought, using layers of dust found in seabed deposits. This helped nourish the emerging awareness of how environmental change may affect societies. Later related Lamont papers include a 2010 study exploring the collapse of southeast Asia’s Angkor culture, and other Asian societies, also apparently due to drought. 2002: Global sea-air CO2 flux based on climatological surface ocean pCO2, and seasonal biological and temperature effects Taro Takahashi et al., Deep-Sea Research Part II Based on some 940,000 measurements taken over four decades, Taro Takahashi and colleagues mapped for the first time on a global scale the exchange of carbon dioxide between the atmosphere and oceans—a flux that plays a key role regulating climate. This was followed by papers including 2009’s Reconstruction of the history of anthropogenic CO2 concentrations in the ocean (Samar Khatiwala et al., Nature), which indicated that since 2000, the world’s oceans may have begun losing their ability to absorb rising human emissions of carbon. 2004: Long-Term Aridity Changes in the Western United States Edward Cook et al., Science Tree rings showed that an ongoing drought in the U.S. Southwest paled in comparison to one during an unusually warm period about 1,000 years ago. It suggested that the region is vulnerable to disastrous drying due to global warming. An influential 2007 paper followed, led by climate modeler Richard Seager: Model Projections of an imminent transition to a more arid climate in southwestern North America,” Science. This added evidence that the region will dry significantly in the 21st century–a transition now probably already underway. 2008: In Situ Carbonation of Peridotite for CO2 Storage Peter Kelemen, Juerg Matter, Proceedings of the National Academy of Sciences With the recognition of the problems caused by rising carbon dioxide, Lamont scientists in several disciplines have been among the first to look into possible ways to capture and store emissions. This paper documents efforts to use natural chemical reactions within deep-earth rocks in Oman to “freeze” emissions into underground reservoirs. Projects by other researchers are looking into piping emissions into the seabed off the U.S. Northeast, or using rocks common on the U.S. mainland. Tree rings contain exquisitely detailed records about past climates. Members of the Tree Ring Lab travel to many remote places to collect and study samples. 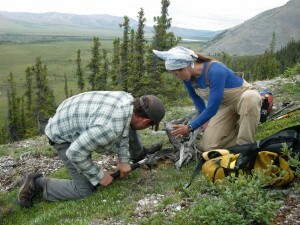 Here, researchers work at the edge of the northern Alaska tundra. 2011: Civil conflicts are associated with the global climate Solomon Hsiang et al., Nature In the first study of its kind, Hsiang and his colleagues linked periodic increases in civil conflicts to the arrival of El Niño. The study found that the characteristic hotter, often dryer weather in certain areas doubled the risk of warfare across some 90 tropical countries, and accounted for a fifth of worldwide conflicts in the past 50 years. There is now speculation (though no proof) from studies done at Lamont and elsewhere that El Niño cycles themselves could be intensified by rising global temperatures in the future. 2012: The geological record of ocean acidification Bärbel Hönisch et al., Science Lead author Bärbel Hönisch and her colleagues showed that the world’s oceans are turning acidic at a rate unprecedented over at least the last 300 million years, apparently due to reactions with human emissions of CO2. This could affect marine ecosystems, and may already be having effects in regions such as the U.S. Pacific Northwest. 2015: Climate Change in the Fertile Crescent and implications of the recent Syrian drought Colin P. Kelley et al., Proceedings of the National Academy of Sciences This study asserts that a record 2006-2010 drought in Syria was stoked by climate change–and that the drought in turn helped propel Syria and surrounding nations into the vast war that has evolved into one of the worst disasters of modern times. It made worldwide headlines, and has become one of the most highly cited pieces of research linking ongoing climate trends with drastic consequences for humanity. 2015: Contribution of anthropogenic warming to California drought during 2012-2014 A. Park Williams et al., Geophysical Research Letters With record-breaking drought devastating California starting in 2012, many scientists began looking at whether global warming was playing a role. Bioclimatologist A. Park Williams and his colleagues showed that while natural factors probably caused the lack of rainfall, global warming played a measurable role in the drought by drying out soils further. The study was instantly seized by politicians and others as hard evidence that climate change is already affecting agriculture, economy and environment in the United States. Deep Sea Sediment Cores from Climate Science TV on Vimeo.